The U.S. Census Bureau has released its “individual unit” state and local government pension fund data for FY 2014 and FY 2015, and based on past practice I probably would have used it to update my databases, produce a bunch of charts, and write a post or two. But comparing these years with the years preceding, it seems that the data has been trashed. This is something I feared after union-backed Comptroller Stringer’s election, reformed sinner actuary Robert North’s departure, and the imposition of somewhat stricter reporting requirements by the Government Accounting Standards Board, which show more clearly just how underfunded public employee pension funds are. The new problem is in the Census Bureau data for the NYC Teachers Retirement System, joining the problem I had already found in data for the NYC police retirement system. I learned in government to never assume a conspiracy when a foul up is an equally credible explanation. Whatever the cause, however, if a fix is to be made the Census Bureau nonetheless will not be updating the 2014 and 2015 public employee data until the 2016 data is released next year. So I’ll probably wait to write about NY and NJ public employee pensions again until then. The TDA program is the equivalent of a 401K that teachers can contribute to, in order to later get retirement income in excess of their pensions. It is the teachers’ own money, not money that could be used to pay pension benefits. According to page 2.1, the pension system’s auditor felt the need to specifically bless (or at least not curse) this change in reporting. So what changed? Under the TDA program, NYC teachers are guaranteed a 7.0 percent return on their own extra retirement investment – vastly higher than the rate anyone else could get in this low interest rate, high debt, post Generation Greed environment. How this could ever be thought of as fair escapes me, but like many other similar deals it probably dates to the stock market bubble of 1982 to 2000. The United Federation of Teachers probably claimed that the pension plan had “excess money,” the same claim used to justify retroactive pension increases, and asked for a share. It is as if someone had guaranteed you an increase of 7.0% per year not from a normal years, but from the peak of the dot.com mania in 2000, with the right to force other people to pay as much as it took to honor that guarantee. In exchange for – probably political support decades ago. Noted page 2.9. That is, in addition to actual payments from the pension fund to retirees, you had payments to the 401Ks of active and retired teachers, to make up for rates of return below 7.0%. Before 2014 this was a retirement benefit paid that was reported as a retirement benefit paid. How is this $1 billion reported now? Looking at the table on page 2.8, instead of money paid out, it appears to be counted as money that didn’t go into the pension fund. Negative “additions” to the fund. The effect on the Census Bureau data is shown in this chart, as $1 billion in benefit payments disappears. Perhaps the TDA payments, based on the manual, should be counted as public school expenditures but not as pension payments at all, except that they are somehow connected with the pension system. So taxpayers are required to pay up for the 7.0% return not immediately, but into the indefinite future, which appears to be what is happening, by having to pay more into pension fund. Is that even legal, given that under the state constitution public employee pensions may not be “impaired?” Moreover, it isn’t “the City” that has to pay. It is people who live and work in the city and have less political power that are actually required to pay the amounts owned, regardless of the consequences, in higher taxes and service cuts. So if the payments from the pension plan to the TDA are not being counted as retirement benefits, where are they being counted? In Census Bureau data they appear to have disappeared – unless they are being deducted from investment returns. Based on the Census Bureau data for the NYC police pension fund, that may be the case. The NYC police got a special pension deal in excess of the actual pensions they were owed as well. In years when their pension fund’s rate of return exceeded the “expected” level, they got a special pension bonus due to “excess” returns. And then the next year when pension returns were below expectations, taxpayers were made to make up the difference – increasing taxpayer costs even if over the long term the expected returns were achieved. This is the exact deal that so outraged people when it was disclosed in the Detroit bankruptcy, with retirees forced to pay back all their “Christmas bonuses” previously awarded by union-controlled pension boards in lower benefits in the future. Some time in the 1990s, that extra pension payment in years of “excess returns” was converted to a guaranteed extra $12,000 pension payment to every retired officer every year, whether the pension fund earned money or lost it. Basically police pensions are $12,000 per year higher than the police and politicians say they are. That is also the case for many police officers and firefighters. So how does that money show up in Census Bureau data? Not as pension benefit payments, even though taxpayers are paying and retired officers are getting. As I wrote last year the Citizen’s Budget Commission looked into it, and got the answer. So instead of reporting that former police officers receive a pension that includes an extra $12,000, the police pension fund reports that its investments returned $500 million less than they actually did. This explains the presumed error I found in the Census Bureau data – the rate of return on the NYC Police Pension fund over the long term was just 4.6% — far less than any other pension fund. 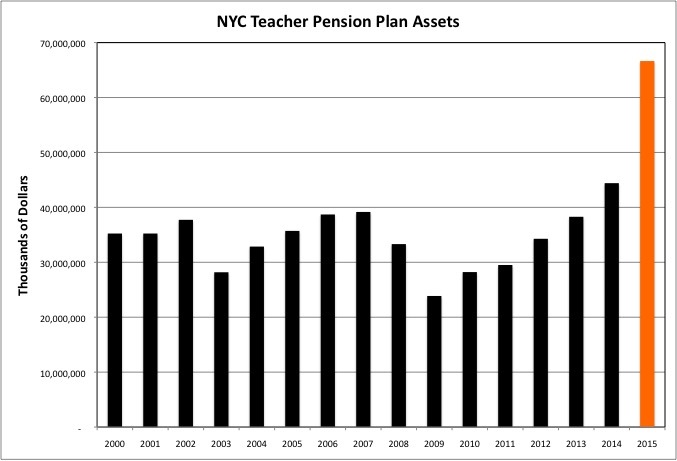 So when Comptroller Stringer reports the rate of return achieved on the NYC teacher pension fund over the past year, will he do so based on returns minus the $1 billion payment by the teacher pension fund to the TDA? Thus making that return seem lower than the returns for comparable plans elsewhere. Or just report the $1 billion as being subtracted from investment returns for purposes of Census Bureau data, with the difference between the two making the $1 billion seem not to exist? Is the plan to make this $1 billion and rising payment just not show up anywhere? And for how long will be paying? A long time, according the NYC TRS CAFR itself, on page 2.44. The expected rate of return was 7.0% before 2000, was 8.0% from 2000 to 2009, and is now 7.0% — the same as the guaranteed rate for the TDA plan. But the actual expected rate of return based on “reality” is given in the report as 5.33%, and that is assuming a 9.9% return on private equity (a ripoff by those who run private equity funds is more likely) and 7.9% for emerging market equities (which have subsequently crashed). That 5.33% is also quite high starting from the current inflated stock, bond and real estate prices. Anyone want to guarantee me that? How about 4.0%? Certainly not. Meanwhile, based on this “combined reporting” another problem cropped up in 2015 Census Bureau data, with all the teachers’ own money in their TDA showing up as pension assets! Suddenly, according to this data, NYC TRS is not only paying out $1 billion less per year than a couple of years ago, but also it has $66 billion instead of $44 billion more in the till! All that has to happen now is for the Fiscal Policy Institute to use this data and issue a report saying that the NYC pension crisis is over, and was probably a hoax to begin with, based on those lower benefit payments and higher pension assets. For the New York Times to use the report as the basis of a front-page story. For the UFT to use the Times story to claim the pension plan is over-funded, and to demand more retroactive pension increases that “cost nothing” as a result. And for all these – and Comptroller Stringer — to subsequently not discuss the NYC pension plan at all once the data is fixed, leaving the false impression they want to leave. Now I could use the NYC TRS CAFR to try to correct the NYC data (and the NY State and U.S. totals) back to the kind of reporting they used to have, and write my post. But as the public employee pension crisis rolls on, the political incentive to lie and cheat becomes greater and greater everywhere, not just here. Particularly in the wake of the GASB revisions. So I can’t be sure about the Census Bureau data from other places either, and will wait for more confirmation of what might be going on. How desperate are members of the political/union class. This is one of the worst I’ve heard. 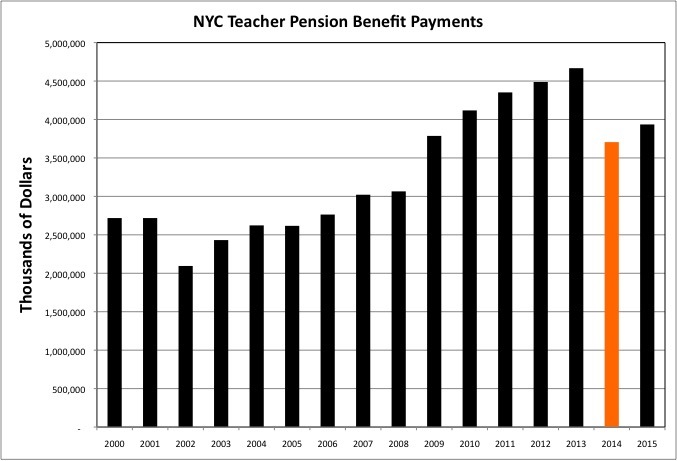 Last I checked the taxpayer pension contribution to NYC TRS for New York City teachers was around 40.0% of payroll. The reason the rate is so low for new non-Title 1 teachers in Illinois is that a union-controlled Democratic Governor and state legislators enacted the mother of all “screw the newbie, flee to Florida” schemes. With new teachers there not only not getting Social Security, but also paying around 100 percent of the total cost of their radically less generous pensions. To offset the retroactive pension increases and taxpayer pension underfunding of the Generation Greed era. All new teachers are presumably on the same end of this screw the newbie, flee to Florida deal whether supported by federal money or not. So the actual cost of their pensions will be the same. But somehow the pension plan is still gouging poor districts hiring new teachers funded with federal money with an assessment at close to 40.0% into the pension fund. How can this be legal? It sounds like the theft of federal funds, something that might happen in New York’s Medicaid program. In any event, its going to be “wait until next year” when it comes to updating my database of public employee pension data in NY, NJ and elsewhere based on the Governments Division of the U.S. Census Bureau. Hopefully I’ll have something for you in the summer of 2017. Or I’ll be writing a much angrier post in the summer of 2017. Hmmm, what else is going to be going on in 2017? In any event, if you haven’t read it before here is an analysis of the public employee pension data for all the pension funds in each state (grouped together, not individually) and for NYC separate from the rest of the state, over 40 years. Irony of ironies. While taxes rise and education services are cut — even though NY has the highest tax burden and school spending — to pay for past pension increases. The New York State United Teachers, the union itself, facing its own pension crisis, is seeking to cut its own employees pensions rather than raise due or cut services enough to get its pension plan out of the hole. Can’t the union just shout down its own members and “change the conversation” the way it has for taxpayers and schoolchildren? Or just sneer and say “tough” because teachers have no choice but to pay, like taxpayers? The whole letter as cited in the article is offensive. The list of excuses for the problem, all of which are nonsense. The assertion that because the issue is sensitive don’t talk about it on social media. Etc. The union’s own staff know the deals they cut with politicians, and the consequences. Now their employer is expecting them to sing cumbayah while telling them that they aren’t among those in on the deal at the expense of the serfs. They are also serfs.